In the new video series “Sports Parents Success Tips,” Dr. Patrick Cohn answers your youth sports psychology and mental training questions that deal with sports parents and the mental gbame challenges their sports kids have. 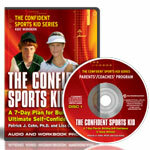 Do your young athletes try to perform perfectly in competition? Watch the video below, Sports Parents Success Video 7: Athletes Who Try to be Perfect, to see what tips Dr. Cohn gives to sports parents to help their young athletes mentally prepare before games.